Image caption Gonorrhoea bacteria: Experts warn that the effectiveness of antibiotics is at risk. Some websites offering treatment for gonorrhoea put patients at risk by not following best treatment guidelines, BBC 5 Live Investigates has found. Sexual health experts recommend patients receive a powerful antibiotic, which can only be injected, but the BBC found seven UK-based websites offering only oral antibiotics. Such treatment can lead to antibiotics becoming less effective, experts warn. The websites, which include Superdrug, say they are providing a vital service. 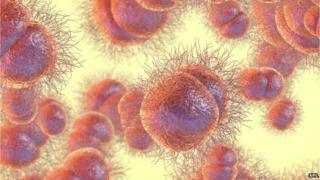 Gonorrhoea is the second most common bacterial sexually transmitted infection (STI) in the UK. Nearly 30,000 people were diagnosed in England in 2013. It can lead to serious health problems if not treated properly. In 2011, the British Association for Sexual Health and HIV (BASHH) - which sets national guidelines for doctors treating gonorrhoea - said the use of antibiotic tablets alone was not the best treatment. They recommend patients should receive a more powerful antibiotic which can only be injected alongside another antibiotic given as a pill. Failure to do so could mean some patients get less effective treatment. But a BBC investigation found seven UK-based websites offering only oral antibiotics, which is not in line with best practice treatment guidelines. The websites provide an online consultation, asking patients for a basic medical history and symptoms. But some failed to advise patients to notify partners they have the disease, or to take a further test to see if the treatment works. They have now changed their advice after being contacted by the BBC. Dr Jan Clarke, president of BASHH, said: "We are deeply concerned if, as it appears, oral antibiotics for gonorrhoea are being used as a standard treatment by online pharmacies. "There is a risk to individual patients, and a real public health risk that the effectiveness of the limited range of antibiotics still available to us will deteriorate through this practice. "From a patient perspective, in receiving oral antibiotics rather than an injection, they are receiving sub-optimal treatment and care." The pharmaceutical chain Superdrug - which runs one of the websites - has now placed a clearer warning online that an injection is the best form of treatment. The company says it saw a 66% increase in the number of people getting treatment for gonorrhoea online last year. It does ask patients to notify sexual partners and offers a free test to see if the treatment has been successful. Its spokesperson said: "Where a patient is unwilling to visit a sexual health clinic for an injection, we provide the oral antibiotic treatment. A practice commonly used by GPs." Two other websites - HealthExpress and Doctor Matt - have now advised on their websites that patients should notify their sexual partners. The Doctor Matt site also now makes it clear that an injection is the recommended best form of treatment. Public health officials say they are concerned that if people are treated in a way contrary to best practice guidelines it could lead to the spread of antibiotic resistance by the disease. A spokesperson for Public Health Wales said: "The intention of online gonorrhoea resources may be well-meaning, but potentially with a lack of realisation about the implications of resistance. Any increase in resistance is a public health concern. "Should online sites be offering treatment which is not in line with BASHH guidelines, this would be a public health concern." The chief medical officer for England, Dame Sally Davies, says patients with gonorrhoea should be treated by their GP or their local sexual health clinic, and should not order treatment online. She explained: "There are concerns many websites aren't meeting national standards. "All medical staff have also been reminded of their responsibilities to help halt the rise in antimicrobial resistance." Find out more with 5 Live Investigates, Sunday 1 March from 11:00 GMT on BBC Radio 5 Live - or catch up online.